Outstanding craftsmanship that provides a trippy, surrealist experience! It’s been a long time since I’ve seen a horror science-fiction film like this one–one that harkens back to the manner in which Stanley Kubrick terrified audiences with his cinematic masterpieces. The brilliance of this film is the visually disturbing storytelling that’s built upon metaphysical and philosophical queries as well as Freud’s uncanny. Written and directed by Alex Garland (Ex Machina) and based upon the Southern Reach book series by Jeff VanderMeer, Annihilation boasts an all-female lead cast that takes the audience on a gripping, nail-biting adventure into the unknown that is frocked with wonder and tragedy. Falling in line with extraterrestrial films, this one exists somewhere between Alien and Arrival with influences from Kubrick and even Salvador Dali. Don’t wait for it to be released on Netflix internationally to avoid watching it at your local cinema; this IS a film best viewed, experienced, and enjoyed on the BIG screen–and not the 65in in your living room. For those who look for and appreciate science-fiction and/or horror films that explore psycho-social and institutional themes, then this is truly a film for you. Cognitively engaging and physiologically disturbing, Annihilation is a turbulent, horrific adventure. After a mysterious meteor-like object strikes a lighthouse in Area X (most likely the swamplands of northwestern Florida), an increasingly growing membrane-like phenomenon is slowly swallowing up the land around it. When several paramilitary and scientific expeditions do not return from exploring the anomaly, biology professor Lena Kane (Natalie Portman) is aggressively recruited to work on the next team of scientists to track, report, analyze and potentially rescue former teams from what’s being called “the shimmer.” Professor Kane and her team have no idea that they will be facing their worst nightmares inside the shimmer as they explore this unknown world filled with dangerous opposition from the creatures that live within and the psychosis-like tension between the team members themselves. Definitely not a film for the general masses. And you know what??? That is perfectly fine. In fact, that’s why this film works so incredibly well as an avant-garde-like science-fiction horror film. Had it directed for the masses, the film would not be nearly as stimulating psychologically and physiologically. Much like Garland did with the Oscar-winning Ex Machina, he crafts a world based on the best-selling series that takes the audience on a disturbing journey into the macabre, which juxtaposes the physical and metaphysical dimensions. Garland’s Annihilation is a masterful cinematic work that combines excellent writing with exceptional imagery and stunning practical effects. If Dali were alive today, this is the kind of film that he would have wanted to work on because there is such a heavy surrealist approach to the production design and visual effects. But this film is so much more than just the cinematic beauty of the motion picture. There are philosophical questions that one may ask oneself that create an added dimension of engagement that further immerses the audience into the world of the film. Much like with Ex Machina, Garland shows an obsession with the need to see and see through when observing an unknown entity that may or may not be sentient. Paralleling how he set up the glass wall between Caleb and Ava (the AI) in the compound/lab designed by Nathan (Oscar Isaac, who is also in Annihilation), Garland sets up the interrogation room in which we are first introduced to Lena while she is being interviewed by the team in hazmat suits. I love the play on perspectives, vantage points if you will in both movies. That fluctuation between a filtered and unfiltered view of the phenomenon under observation offers much depth to the storytelling. 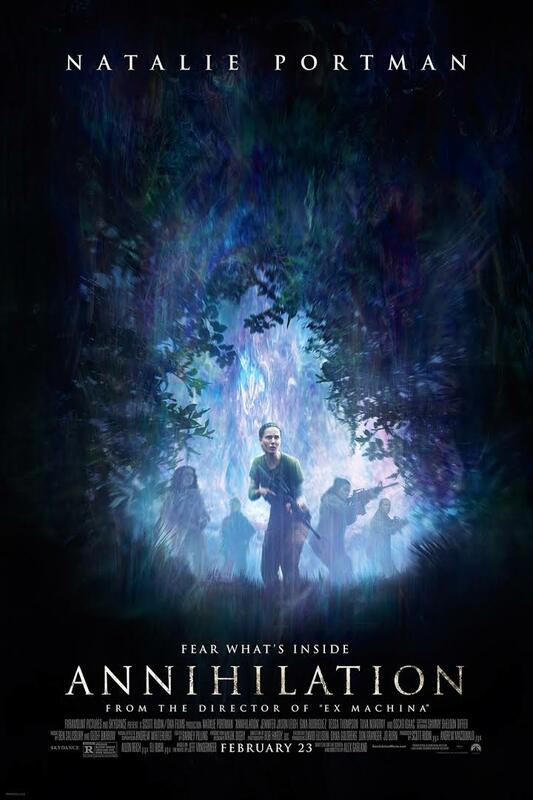 In Annihilation, we are initially introduced to the shimmer, and world within, through sensors, readouts, and other “filters” but then we are thrust into the horrifying flora, fauna, and animal life without any type of protective boundary. Freud refers to the revealing of that which should remain hidden or the return of the repressed (which we literally get to witness in this film) as that which is uncanny (click for article). Just as our characters are constantly searching for clarity, you will find yourself paying close attention to the unknown to gain an unhindered understanding of what you are witnessing. Not your average science-fiction horror film, this one will truly get under your skin–much like The Shimmer invades the bodies of those who choose to enter the dark twisted, refracted world of that which lies beyond our senses. Truly terrifying, this film is one for those who love a sci-fi horror that will prompt you to contemplate the themes and subtext of the movie. One of the quandaries that face the characters, and by extension, the audience is the idea of self-destruction versus suicide–the physiological versus the psychological components. For those who may worry that the film is “too intellectual,” the story is told in such a way that it not only appeals to film critics, academics, or horror aficionados but can be enjoyed by those who like a good, disturbing scare. The fact that there is the “intellectual” dimension to the film adds to the experience for those who appreciate that element in visual storytelling.